Blackmagic Design today announced DeckLink 8K Pro, a new high performance capture and playback card featuring quad link 12G‑SDI to allow real time high resolution 8K workflows. This new DeckLink 8K Pro breaks new ground in high quality as it supports all film and video formats from SD all the way up to 8K DCI, 12‑bit RGB 4:4:4, plus it also handles advanced color spaces such as Rec. 2020 for deeper color and higher dynamic range. DeckLink 8K also handles a massive 64 channels of audio, stereoscopic 3D, high frame rates and more. DeckLink 8K Pro will be available in early January for US$645 from Blackmagic Design resellers worldwide. In addition, Blackmagic Design has also announced a new low price of US$895 for DeckLink 4K Extreme 12G. DeckLink 8K Pro will be demonstrated at InterBEE in Japan on the Blackmagic Design booth 8211. DeckLink 8K Pro is the ultimate digital cinema capture and playback card. Featuring four quad link multi rate 12G‑SDI connections, DeckLink 8K Pro can work in all SD, HD, Ultra HD, 4K, 8K and 8K DCI formats and is compatible with all existing professional SDI equipment. The 12G‑SDI connections are also bi-directional so they can be used to either capture or playback quad link 8K, or for the simultaneous capture and playback of single or dual link SDI sources. When it comes to quality, DeckLink 8K Pro is better than any other solution because it lets customers work with both more pixels than ever before and better pixels than ever before. The 8K images have 16 times more pixels than a regular 1080 HD image, which lets you reframe or scale shots with incredible fidelity and precision. DeckLink 8K Pro also works in 12‑bit RGB 4:4:4 as well as Rec. 2020, which is a massive color space designed for high dynamic range Ultra HD and digital cinema work in 4K and 8K. The combination of higher resolution, a vastly larger color space and incredible dynamic range means that DeckLink 8K Pro delivers the sharpest and most vivid images customers have ever seen for editing, color and high end visual effects work. DeckLink 8K Pro supports capture and playback of 8 or 10-bit YUV 4:2:2 video and 10 or 12‑bit RGB 4:4:4. Video can be captured as uncompressed or to industry standard broadcast quality ProRes and DNx files. DeckLink 8K Pro lets customers work at up to 60 frames per second in 8K and supports stereoscopic 3D for all modes up to 4K DCI at 60 frames per second in 12‑bit RGB. 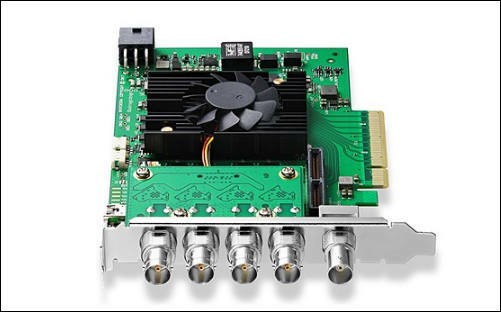 The advanced broadcast technology in DeckLink 8K Pro is built into an easy to install 8 lane generation 3 PCI Express for Mac, Windows, and Linux workstations. Customers get support for all legacy SD and HD formats, along with Ultra HD, DCI 4K, 8K and DCI 8K, as well as Rec. 601, 709 and 2020 color. DeckLink 8K Pro is designed to work seamlessly with the upcoming DaVinci Resolve 14.2 Studio for an incredibly seamless editing, color and audio post production workflow that lets you master full resolution high dynamic range projects in full 8K resolution. In addition, DeckLink 8K Pro also works with other professional applications such as Final Cut Pro X, Media Composer, Premiere Pro, After Effects, ProTools, Nuke and more. There’s even a free software development kit so customers and OEMs can build their own custom solutions. DeckLink 8K Pro will be available from Blackmagic Design resellers worldwide for US$645 in early January. DeckLink 4K Extreme 12G is available now from Blackmagic Design resellers worldwide for US$895.